By Nora K. Wallace, Santa Barbara News-Press Staff Writer; February 9, 2014 12:15 AM For some 16 years, Neda DeMayo has worked tirelessly in her quest to preserve the last of America’s wild horses and the open lands on which they run. She has lobbied politicians, been a relentless fundraiser, and has given her life to a heartfelt advocacy that led to the creation of the 300-acre Return to Freedom Wild Horse Preservation and Sanctuary in Lompoc. In this “Year of the Horse,” she and her supporters are fighting even harder to stop the roundup of wild horses and to abolish their slaughter for largely foreign food markets. 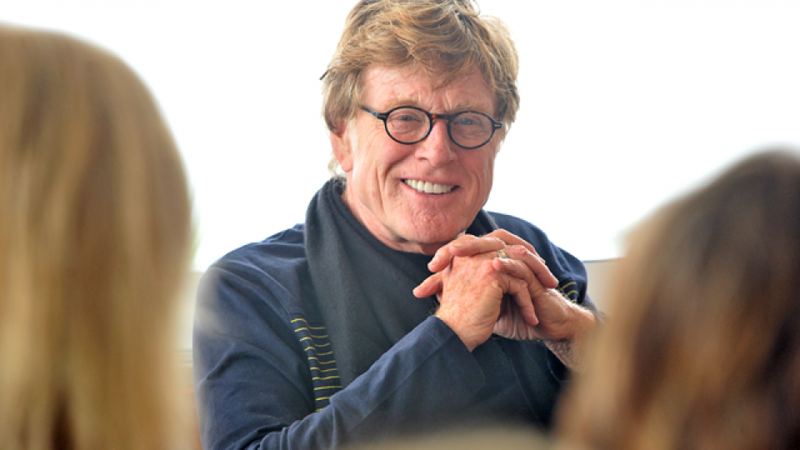 On Saturday, at an intimate fundraiser for about 30 people, Ms. DeMayo got a much-needed boost from an iconic Hollywood star and longtime horse advocate, Robert Redford, who is lending his name and star power to Ms. DeMayo’s dream to create a Wild Horse and Wildlife Land Trust. Robert Redford and Return to Freedom Wild Horse Preservation and Sanctuary Founder, Neda DeMayo. Click to enlarge. Ms. DeMayo said Return to Freedom will be working on getting the government to establish incentives and tax credits for ranchers who have permits to graze livestock on public land where wild horses roam. If the ranchers give up some of the so-called “animal units” to the horses, roundups and culling can be prevented in the future, Ms. DeMayo hopes. That, coupled with the use of natural contraception for wild mares and the establishment of wildlife corridors, is part of a multi-pronged approach, she said. “I think if we all support those directions, I think we could get somewhere,” said Ms. DeMayo, a former Hollywood costume designer and fashion stylist. In addition to his new public association with Return to Freedom, Mr. Redford, along with former New Mexico Gov. Bill Richardson, has formed the Foundation to Protect New Mexico Wildlife, to fight efforts to reopen horse slaughterhouses in the U.S. In the effort for more widespread recognition of the issue, Mr. Redford suggests advocates tell the story of wild horses. “Identify horses with the word ‘America’,” he said. “The horse is iconic, symbolic of America. And what is America? America is freedom. And that’s how we became America; we sought freedom from other rule. The horse is symbolic of our cause. It starts there, with telling a story.” With that imagery, the concept can be that “the people who are slaughtering become un-American,” Mr. Redford said. Ms. DeMayo said 160,000 horses went to slaughter last year. “Horses will continue to suffer until we pass legislation to prevent any horses from being sold or transported for slaughter in this country,” she said. “If we allow slaughterhouses to get their foot in the door again, it will never end.” The situation, Mr. Redford said, “is pretty grim.” “I believe the more people who know about it, the population of support will increase,” he said. “That’s our role right now, to collectively get the word out. There are so many horse lovers in this country who are not aware of this. If they were, they would speak up on our behalf.” Ms. DeMayo said Return to Freedom, with more than 400 rescued wild horses and burros, has outgrown its acreage on Jalama Road. She has been seeking a larger ranch, with adequate water and grazing rights, possibly in Oregon. Needing at least $10 million, the organization has raised about $3 million so far, she said. During the brunch, Ms. DeMayo and Jennifer Leeds, founder of the Giant Steps Foundation, announced the formation of a $100,000 challenge grant to support Return to Freedom’s preservation of wild horses and Ms. DeMayo’s land-trust dream. Television star Wendie Malick, who is producing a biopic on horse preservationist Velma Johnson, or “Wild Horse Annie,” kicked off the effort with an immediate $5,000 donation. That was quickly matched by a number of other people, as well as supporters who chipped in $1,000 donations. By the end of the morning brunch, it appeared Return to Freedom was about halfway toward its challenge grant goal. Robert Redford addresses wild horse advocates during a fundraiser for Return to Freedom Wild Horse Preservation and Sanctuary. Click to enlarge.